Today was the first day of the sixth edition of the South Delta Jazz Workshop and festival. The rain did not dampen any spirits as we met with all the workshop students and divided them out into our ensemble groups. The first noon hour concert of the festival featured a spirited performance by Delta’s own Chris Davis on trumpet. Chris also gave a master class to our trumpet students this afternoon. 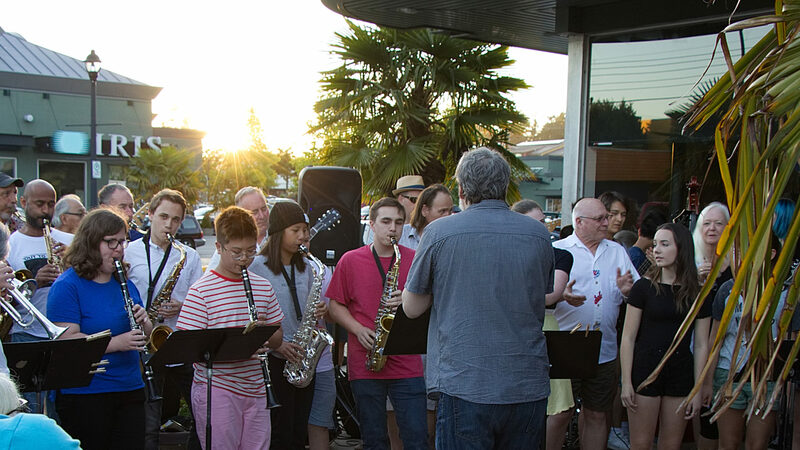 Originally from Florida, Chris finds himself living here in Ladner BC with his family and is fast becoming part of the local Vancouver Jazz scene. I caught Chris playing this past weekend with clarinetist James Danderfer at the Vancouver International Jazz Festival, and his performance both today and last Sunday was very fine. He displayed his wonderful talents today on both trumpet and fugelhorn. Tomorrow the Fesitval continues with a noon-hour concert at the McKee Seniors Recreational Centre featuring our Workshop Faculty Band.